A new short film describes the antimatter-generating efforts of Positron Dynamics, a company seeking to build an antimatter space propulsion system. Reaching even the closest star to the sun would take tens of thousands of years using conventional propulsion — but an antimatter engine could cut that trip down to just 40 years, according to the company Positron Dynamics. In a new video by Speculative Films, scientists talk about the challenges of visiting Earth's neighboring star system, Alpha Centauri, and the way antimatter could power such a journey. "We're working on a propulsion system based on antimatter that should be able to get us to Alpha Centauri in about 40 years," Ryan Weed, a physicist and CEO of Positron Dynamics, said in the video. 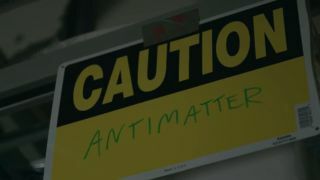 "When you're talking about an antimatter drive, it's about 1,000 times more efficient. You can actually accelerate to a significant fraction of the speed of light, which is really a requirement if you want to go to something that's 4 light-years away." The company researches how to produce and cool positrons — the antimatter analogue to electrons — out of a facility in Livermore, California. Positrons are the easiest form of antimatter to create, the company said on its website, and these particles' interactions with ordinary matter could propel a spaceship. The company was initially funded by the Thiel Foundation's Breakout Labs in 2013. The video also puts in a plug for Project Blue, a new effort to launch a telescope to search for potentially habitable planets orbiting Alpha Centauri, just over 4 light-years away. (Project Blue is running a crowdfunding campaign on Kickstarter.) Such a discovery would be a strong motivation for efforts like that of Positron Dynamics, researchers said. "That a habitable planet might exist so close by would be an extraordinary and really transformative discovery," Bill Diamond, the president and CEO of the SETI (Search for Extraterrestrial Intelligence) Institute in California, said in the video. The International Astronomical Union recently announced that Alpha Centauri is now officially called Rigel Kentaurus. But it'll probably take a while for this change to sink in.